There is an ultrl_marathon — „TransEurope-FootRace“ . 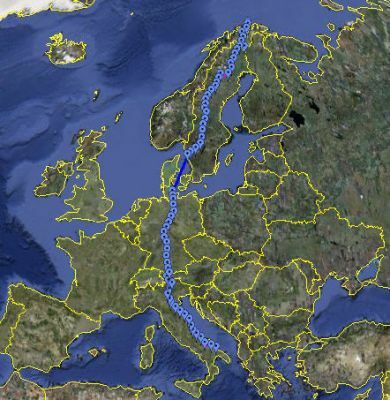 The race is run from Bari, Italy to Nordkapp, Norway. It’s held from April 19th to June 21st 2009 about 4.700 km in 64 Stages. This is the first time a Taiwanese Ching-Hui Chen participate in this contest. I like to know more about the situation of him every day, to give him encouragement. I am a good google earth developer, so I created this website, you can click on “current position” icon and fly to the date competition schedule, or the left side column of the daily itinerary, the screen will automatically fly to the place, you can also click on “trans europe footrace 2009” icon, enter the official website. If you are familiar with google earth, you can download KMZ Collection , enter the Google Earth to watch voluntarily. This entry was posted in GE Marathon and tagged Trans Europe 2009. Bookmark the permalink.